If you go out onto the reef flats at night in Guam with a flashlight, you might run into this little guy. If you do see it, be careful. They appear to be attracted to lights and they can deliver a painful little sting. 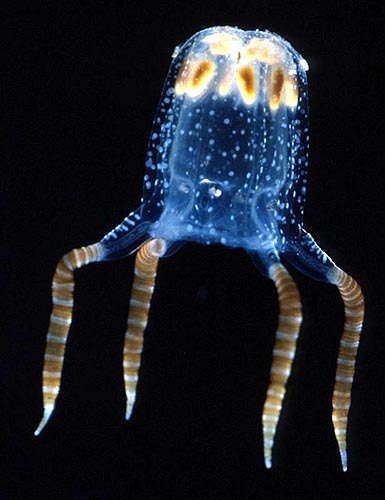 According to Gustav Paulay, this cubozoan spends its days attached by its bell to the undersides of rocks. In the lab, they have been observed to stick themselves to a variety of substrates, including glass, dead coral, and live algae. To attach themselves, these box jellies have "sticky pads". The larger white patches near the top of the bell of the specimen above might be the sticky pads. Another interesting tidbit of information about this cubozoan is that it comes out in droves during the once-a-year coral spawning event on the Great Barrier Reef, Australia. Carybdea sivickisi has a bell that is about 1 centimeter tall in a fully grown individual. Click on the buttons below to find out more about Cubozoa.